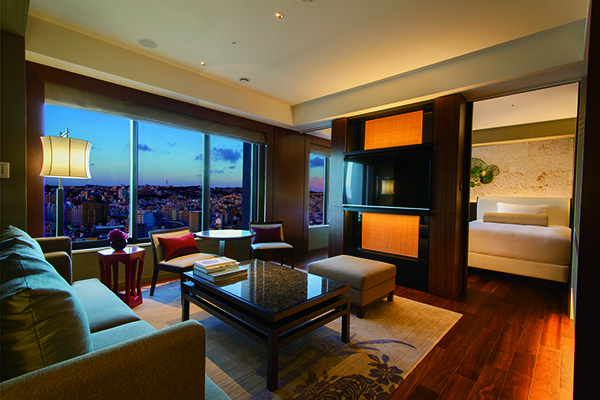 Naha City's many hotel offerings have been building a well-deserved reputation as great destinations for foreign and domestic businesspeople. The city's proximity to Okinawa's international airport and the island's business and industrial hubs have created a demand that has been filled by several world-class accommodations. Meanwhile, Naha's other charms – its quaint shops, local history and unique shopping – seemingly exist in the background. As a result of this, many of the hotels in the city have tended away from leisure and more toward convenience. If a traveler wanted a resort-type experience, choices were better selected from more remote regions, such as the villages of Onna or Yomitan. With the opening of the Hyatt Regency Naha, Okinawa almost two years ago, however, visitors have a new choice for a leisurely stay in a true resort hotel in the heart of the city. Located in the Sakurazaka district, just three miles from Naha Airport, business travelers will appreciate the Hyatt for its easy commute to the Okinawa Convention Center or to city and prefectural offices. On the other hand, tourist attractions such as Kokusai Street with its famous department stores and many eateries, and Makishi Kosetsu-Ichiba with its bustling souvenir shops and markets are within walking distance. Tsuboya Yachimun Street, winding through Naha's famous traditional pottery district, is also just a few minutes' walk from the new Hyatt. There is enough fun and excitement to please the tourist in everyone just outside the lobby door. 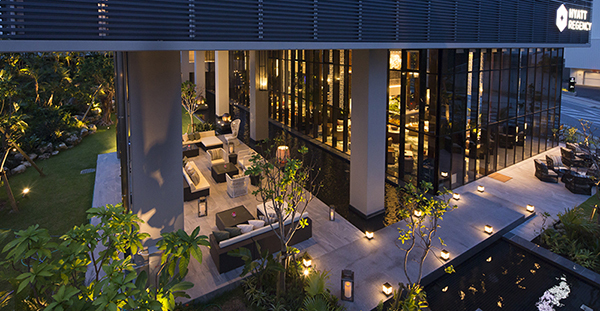 Billing it as “the gateway to Asia,” Hyatt has wrapped its newest jewel – the 10th under the Hyatt name in Japan – with sophistication and service that do not disappoint. With a nod to its international focus, many among the staff we encountered were bilingual, adeptly switching from Japanese to English as situations warranted, Employees fluent in other languages, such as Korean and Mandarin, add to the international milieu and exceptional service. The hotel features 294 guestrooms with 14 suites, two restaurants, a bar, the exclusive Regency Lounge, modern exercise facilities and conference rooms. 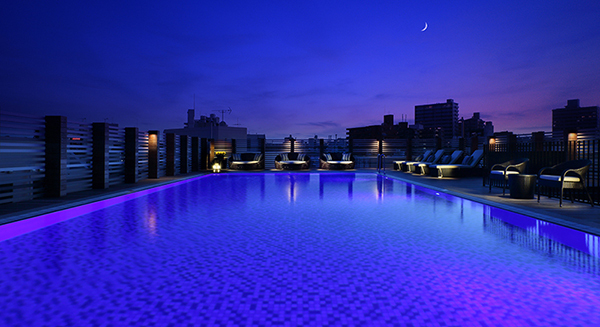 The third floor has a shallow kids pool and whirlpool and – unusually for a Naha hotel – a 15-meter by 7-meter adult swimming pool. The new Hyatt Regency is dressed from top to bottom in tasteful decor rendered in the blues and earth tones of Okinawa, accented with original island-created works of art. Hallways on the guestroom levels have plush carpet that is easy on tired feet and which also serves to dampen noise from the hallway. All rooms feature free WiFi and other amenities that make for a relaxing night in for vacationers, or an easy work area for businesspeople. Beds are by Sealy, and rooms offer charming views of the surrounding area. Décor is a mix of locally inspired colors and themes – all rooms in fact, have on display delicate art pieces by Ryukyu glass master Seikichi Inamine. The 14 suite rooms are located on the 16th and 17th floors – each a more luxurious version of the twins and deluxe twins on the lower floors, combining added space, décor and deluxe furnishings to form an oasis of beauty and ergonomics. The deluxe suite that we viewed had a living area with separate bedroom – each with its own widescreen television. The bath was a spacious array of metal, marble and glass with perhaps more of the comforts of home than most homes. The two restaurants are located 16 floors apart and offer different but complementary experiences. Restaurant Sakurazaka on the second floor serves an array of local and international cuisine during the breakfast and lunch hours only. Located just above the main lobby, the spacious dining room seats 198, including 42 on the terrace, and provides elegant, convenient dining near the ground floor for businesspeople or vacationers starting their day. Buffet style service keeps things moving in the busy morning and noon hours, while a panoramic view of the historic neighborhood provides a vibrant backdrop that places diners in the heart of the Sakurazaka district. An elevator ride to the 18th floor transports patrons above the guestroom levels to evening dining and entertainment options. To one side of the elevator lobby the entrance to Milano | Grill beckons. The Milano, the hotel’s fine dining offering, is open for dinner service only. Inside, guests are treated to the elegant, small details that combine to make the Hyatt Regency Naha, Okinawa experience memorable. 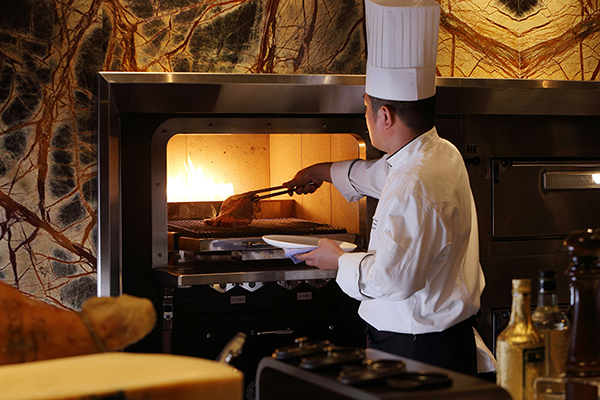 Prepared in “open ovens and grills,” Milano's Italian cuisine is presented to guests on traditional trolleys. There is seating for up to 58 in the main dining room and an additional 12 in the private dining area. Just down the hall from Milano is The Bar. There is a small cover charge (waived for Regency Club members). Up to 62 guests are treated to live music, nightly, and seating that is arranged so that all have a view of both the city and the piano from almost every seat. 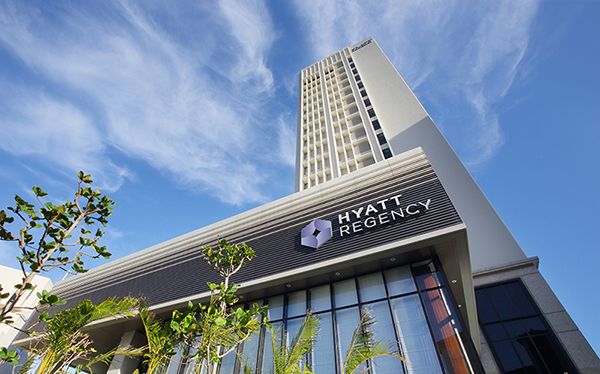 All in all, the new Hyatt Regency Naha, Okinawa offers a blend of modern and classic sophistication to visitors traveling to the island for business, pleasure or both. On one hand, its central location and its many business-friendly amenities and services make it a haven of convenience for work-related travel. On the other, the new Hyatt’s comfort, beauty and true resort features will appeal to vacationers from all over the world.